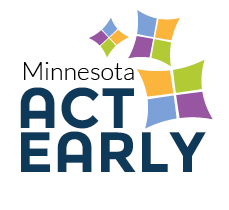 Minnesota Act Early is a statewide outreach campaign that reaches out to families, communities, and organizations to promote early screening and early identification of potential developmental delays. The Minnesota Act Early team educates about healthy development, early signs of Autism Spectrum Disorder (ASD) and other developmental delays, the importance of regular developmental screening, and early intervention when there is a concern. Whether you are a parent or a professional who works with young children and their families, our hope is that you will find helpful information at the MN Act Early website to promote healthy development in all children. Learn the Signs — Developmental milestones are skills your child learns such as taking their first step, smiling, waving, and pointing. As children grow older, they reach milestones in how they interact with others, play, learn, speak and behave. While each child is different and develops at their own pace, there are ages in which a child typically acquires a new skill. Some of these skills can be subtle while others are more obvious. Each stage of your child’s development is a new journey in how they interact with others and their environment. Learn about developmental milestones and celebrate your child’s individual development! You should also become aware if your child is not reaching some of those important milestones or loses previously developed skills. By having the skills and knowledge to keep track of your child’s development, you can notice earlier on if your child is having trouble in one area and seek help. Act Early — Regular screening allows both professionals and families to celebrate progress and identifies useful supports for children who have a developmental delay. Developmental screenings are recommended and useful for all children because early treatment and intervention will help children reach their potential. Screenings are short tests that assess a child’s development and help identify delays. 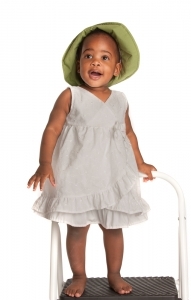 The American Academy of Pediatrics recommends screening for children at 9 months, 18 months and 24 or 30 months. Usually, children can be diagnosed with autism at 24 months. Keep track of your child’s screening record, history and results! You can use the developmental screening passport from “Birth to Five, Watch me Thrive” sponsored by the U.S. Department of Health and Human Services and The U.S. Department of Education.